Evening! After a day of swatching my cuticles are now enjoying a well deserved layer of oil while I write this post :) Madeleine, the creator of Cadillacquer, recently came out with her first collection called Do You See What I See? and today I have swatches of these 9 polishes for you. All swatches are with top coat and the description of the polish is from Madeleine. "9 Crimes has a grey/purple base color with gold shimmer and various sized silver glitter"
9 Crimes gave a nice surprise when I applied it, I somehow hadn't noticed the gorgeous shimmer in the bottle! I thought it was pretty already, but that shimmer really makes it something special. I used 3 coats to get this squishy look and it dried to a glossy finish. "Cute Poison has a smoky green base with black square glitter and small pink holo, green and fuchsia glitter"
I found that small glitter hard to describe, but luckily Madeleine did that already =) On first sight it looked like pink and green glitter, but then you see the other colors! It's one of those bottles that spend some time being turned around in my hand with me staring at it, lol. I used 2 coats of Cute Poison. "Dollhouse has a light pink base with different sized silver glitter, rose square glitter and rose dots"
"I Wish I Was The Moon has a blue base with iridescent square and hex glitter"
Ahh the colors of that glitter, so so gorgeous and vibrant, and so beyond my camera! The description forgets about 1 thing, it also had tiny glitters in a beautiful, deep blurple color. I used 2 coats, but this one did apply a bit goopy. "Easy As Pie has a purple base with small white glitter, different purple glitter and fuchsia dots"
I think the white glitters make it look so fresh! I was afraid I'd have to fish for the pink ones, but I gave the bottle a shake and dipped the brush in a bit deeper than normal, and I had no problems at all getting them on my nails. 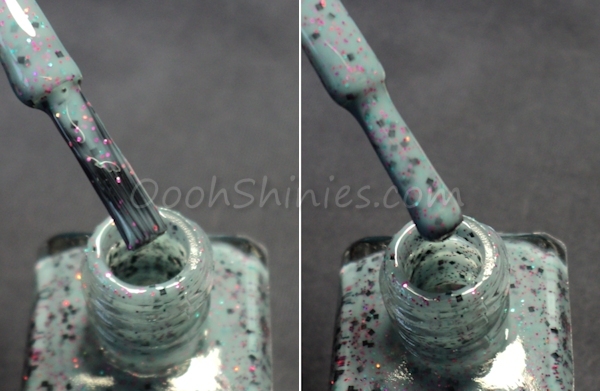 I used 3 thin coats here, and this one was slightly goopy too. "Remember Me has a mint green shimmer base with various sized silver glitter, small fuchsia glitter and fuchsia dots"
This one also has the round pink glitters, and I had no problems getting them on my nails here either. Spring on my nails! I used 2 coats. "Morning Comes has a light blue base with small white glitter, small periwinkle glitter and bigger periwinkle hex glitter"
This one photographed a bit too bright, the basecolor is a bit more washed out. I used 3 thick coats, but as with several of these polishes, you can go for a more sheer look as well by applying thinner or less coats. "The Dark... Whatever has a sheer blue/grey base with small black, small iridescent and bigger blue hex glitter"
The fine blurple glitter is so pretty, I think it goes so well with the basecolor! I used 3 thick coats of it, but it's ment as sheer and next time I'd go for less coats or just layer it, because it turned out a bit too thick on my nails. "Where Is Carl? has a white base with blue shimmer, small and bigger ocean blue holo glitter and small dark blue glitter"
This one's one of my favorites, those ocean blue glitters that flash different colors of green and blue... love them! I used 3 thin coats and it dries up glossy. This one can also be built up from sheer to full coverage, like I'm showing here. I really like that these are polishes with plenty of glitter, but without being crazy glitterbombs, and most look a bit squishy. The color combinations are great as well! Especially those washed out basecolors with the brighter glitters stand out for me, they go so well together ♥ The application of these was fine in general, plenty of glitters in them, but just a few goopy ones. Most of them did dry a bit slow though, but it's nothing a quick-dry top coat can't fix (which you'll want to use anyway, as usual with glitters most dry up slightly gritty). You can buy Cadillacquers here and you can also find these polishes on Facebook. What do you think of these? And what do you think of Indie polish in general?